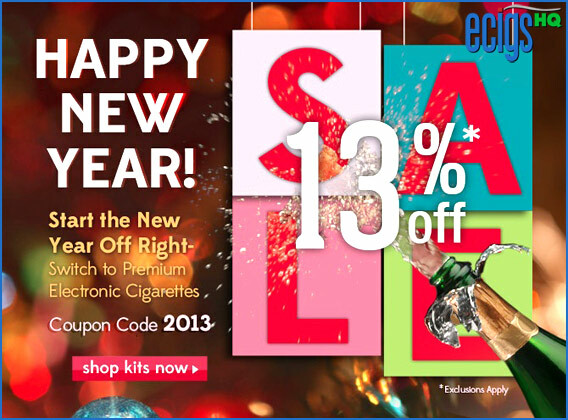 eCigs HQ: Green Smoke New Year's Discounts! Home » e-Cigarette Coupon Codes » Green Smoke New Year’s Discounts! Green Smoke New Year’s Discounts! Offer good December 27th to January 1st. NEW Green Smoke 13% OFF Coupon Code! Ring out the old – ring in the new! Green Smoke® electronic cigarettes wants you to start the New Year right — and get MORE smoking enjoyment for LESS! SAVE 13% on everything you need to enjoy the Green Smoke experience — including kits, cartomizers, and batteries. Click here and use coupon code “2013” to start the New Year right. Enjoy new lower kit prices! Substantially lower prices for all kits and batteries make it easy and affordable to switch to an ash-free, odor-free, smoke-almost-anywhere-you-want lifestyle. Offer good December 27th to January 1st. Exclusions apply. Click here for Green Smoke New Year’s Sale. CERTAIN EXCLUSIONS APPLY. OFFER SUBJECT TO CHANGE/WITHDRAWAL AT ANY TIME WITHOUT PRIOR NOTICE. Reviewed by Admin in e-Cigarette Coupon Codes, e-Cigarette Special Offers | Comments Off on Green Smoke New Year’s Discounts!